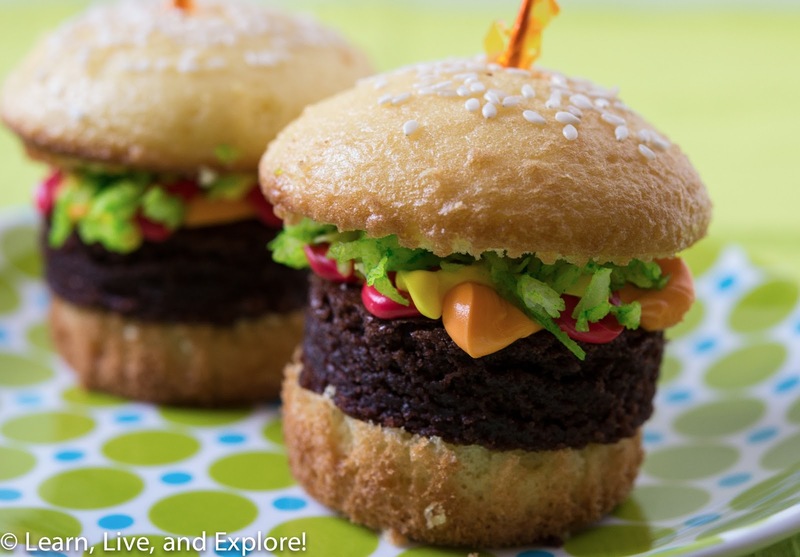 July Cupcake of the Month - Burger Cupcakes ~ Learn, Live, and Explore! 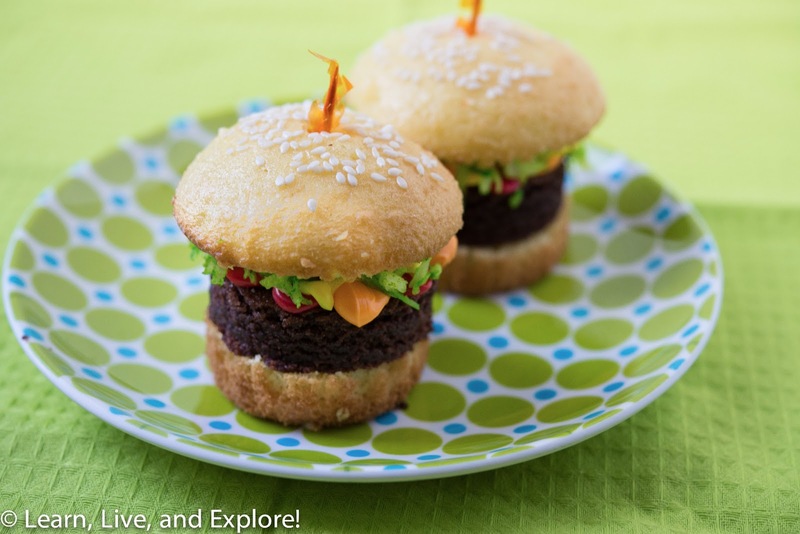 This month's cupcake inspiration comes from summer cookouts and Bakerella's burger cupcakes. Once again keeping it simple, both brownies and yellow cupcakes were made from boxed mixes and the frosting was colored right out of the store bought can. First, bake the yellow cupcakes and let them cool. While they are cooling, bake a thin sheet of brownies (13" x 9" pan works for this). Pour sesame seeds into a bowl and gently press the cupcake tops into the seeds to get a realistic amount on the "bun." Unwrap the cupcakes while the brownies are cooling. 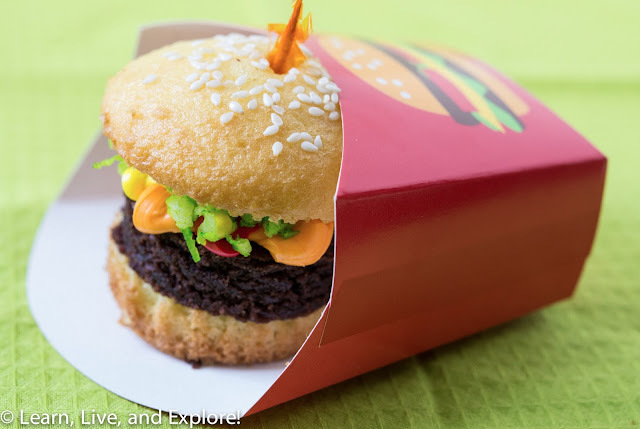 Slice off the cupcake top, then slice off and dispose of (trash or mouth) the middle third section of the cupcake. 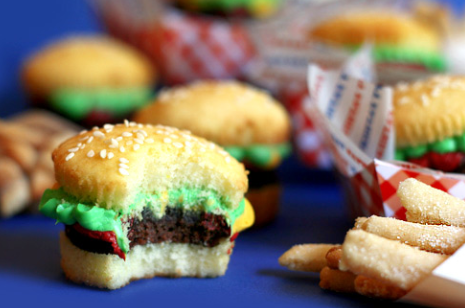 When the brownies are cool, take a 2" round cookie cutter and cut out the "burgers". Set aside. Dye the frosting red (ketchup), yellow (mustard), and orange (cheese) then place each color into piping bags (no tip). For the lettuce, you can go simple and dye some more frosting green or you can put some sweetened coconut into a ziploc baggie, squirt some green dye in the bag, close it up and shake until you have "lettuce." I suppose it depends on if you're going for realistic (good photo) or for flavor because some people don't like coconut when paired with the combination of brownie and yellow cake. Assembly is simple: bottom "bun," brownie burger, orange frosting in a square outline on the burger, mustard and ketchup loosely squeezed all over the burger (drip down sides), sprinkled on green coconut lettuce, gently applied top sesame seed "bun," and a toothpick down the middle to hold the stack together.